We haven’t done justice to carbon. So far we’ve talked about it as a component of the atmosphere, the substance of living tissue and in sequestered deposits underwater or underground. But carbon gets around a lot more than that. There are lots of carbon cycling graphics on the web, but this one is nice because it provides some numbers. I can’t vouch for their precision, but the orders of magnitude are about right. 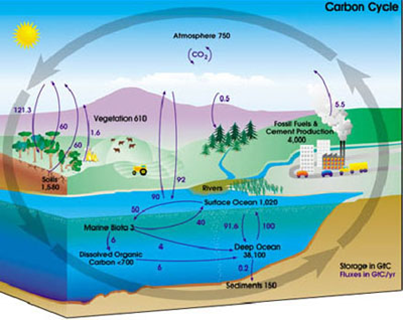 To talk knowledgeably about the carbon cycle we need a couple more terms. Carbon sinks are the locations where carbon accumulates and decumulates; think of them like reservoirs in a water management system. Carbon fluxes are the movements of carbon from one sink to another, with the analogy to pipes that transport water. Sometimes people refer to the back and forth movement of carbon between sinks as carbon exchange. So let’s take a look at all this fluxing. Begin with atmospheric carbon. Some of it is fixed through the process of photosynthesis into living tissue, where it shows up as either land or marine organisms. If it’s on land, it can readily migrate into the soils; if it’s at sea it can become dissolved carbon or make its way to ocean sediments. 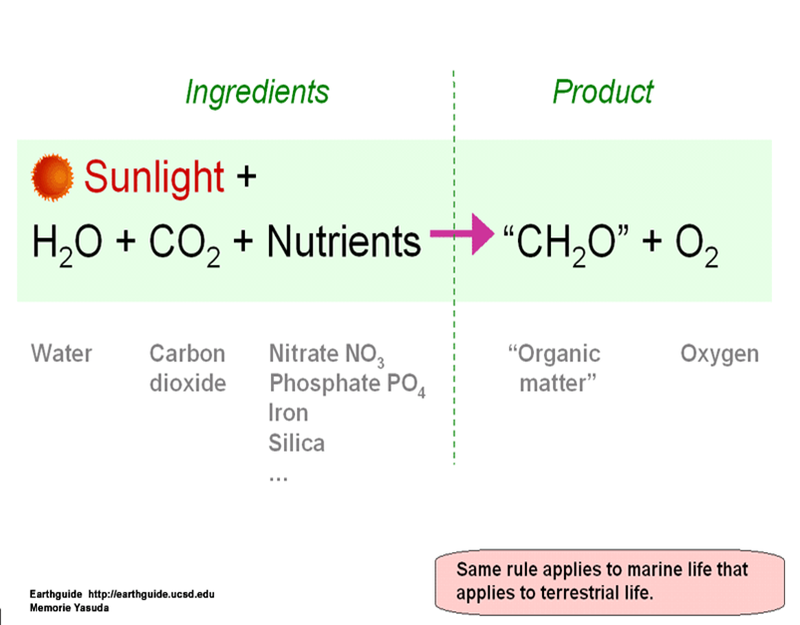 But carbon can also be exchanged directly between atmosphere and ocean in both directions. Soils too, as they weather, can release carbon. It’s important to recognize that carbon exchange is everywhere. Here is where the water management analogy breaks down. A water system has a fixed number of pipes; control them and you control everything. The global carbon cycle moves through every surface and interface, in every gust of wind, drop of water, in every leaf—everywhere. Human beings can influence it to some degree, for instance through land use policies, but only to a limited extent. It is a massive, pervasive natural process that transcends us in every respect. In fact, we ourselves, physically, are just tiny elements in that process, temporary carbon sinks that exchange constantly with the environment and are destined to release their carbon after death. Does this sound benign? There is a limit to how much carbon can be concentrated anywhere in the system, because fluxes will restore a degree of equilibrium. If the carbon concentration in the atmosphere gets out in front of the carbon in the ocean, for instance, fluxes from air to sea will be greater than those in the opposite direction, and a new equilibrium will arise. This is a force for stability. Alas, there is another force that destabilizes this cycle—us. Clever creatures that we are, our fossil fuel operations reintroduce carbon that had been kept out of the cycle for eons. We mine or pump this stored carbon, and then it joins all the rest of the carbon in its many sinks and fluxes. The critical moment is when carbon that had been excluded from the cycle is returned to it. Once this happens, it simply increases the amount that cycles through the system: the sinks all get bigger carbon loads (if they can handle them), and the fluxes get bigger too. This is one of the fundamental truths of the carbon cycle—one that many policy-makers and opinion-molders misunderstand—so it bears repeating: don’t blame the carbon cycle! The problem is not that carbon moves from the plants to the soils, or the soils to the atmosphere, or the atmosphere to the ocean, or wherever. It will do that. The problem is that we’ve made the cycle bigger by adding additional carbon to it that had been locked out for millions of years. Once we do this, our ability to steer it is limited in the short run and nearly zero in the long run. As we’ll see, a lot of what people talk about in the realm of climate policy consists of exactly this misguided approach. To sum up, today’s message is simple: carbon cycles through our world propelled by biological, geological and chemical forces. It doesn’t like to sit still. It is folly to try to control its movements. If you want less carbon in the atmosphere, don’t try to prevent fluxes into it—stop adding to the amount of carbon that flows through the cycle. Until we figure out a feasible way to withdraw carbon from its cycle completely, through artificial sequestration (and this is very iffy), keeping fossil fuels in the ground is what it’s all about. Anyone who has studied this debate knows that this summary bears no relation at all to what was actually argued over. Piketty seems like a smart, open-minded guy, so I would have to assume that he hasn’t read the original documents; his take must have been formed by what he was told in grad school. If so, this passage can be read as a reflection of how the Two Cambridges battle has been turned into official history. That’s a discouraging thought. On this issue I would side with Keynes, for whom profitability does depend on the future, but who viewed the future as truly, radically unknowable. The result is that there is a cost price for capital goods and a constantly fluctuating market valuation of capital-in-use, and there is no theoretically determinate relationship between the two. Or to put it differently, the owl of realized capital valuation flies at dusk. So I earlier argued here that ISIS(ISIL) or DAEESH was not yet claiming itself to be a caliphate, and that its leader, Abu Bakr al-Baghdadi was only calling himself "al Hakim," or "Ruling Emir," even as I recognized that he had turned over this title to someone else, preparing the way for possibly declaring himself caliph (khalifa), while the media was already doing so inaccurately. Well, now it has happened. Yesterday his group declared that henceforth they are to be called "The Islamic State," no more ISIS vs ISIL vs DAEESH. And his followers have sworn fealty to him as, yep, khalifa, or caliph. They are now a genuine wannabe caliphate. As usual, Juan Cole provides the best current and historical discussion at this location. Compared to my previous piece, he has a few differences. He claims the Ummayyads were just "Arab kings" rather than caliphs, although that disagrees with most of what I have read. He claims that most Muslims accept that the caliphate died in 1258 with the Mongol conquest of Baghdad. He also claims that it was only in the 1880s that the Ottoman sultans claimed to be caliphs. Finally, he says that Taliban leader, Mullah Omar also has claimed to be caliph as well as al-Hakim, Ruling Emir, and he speculates on what would happen if he and al-Baghdadi were to end up in the same jail cell arguing over who is really the caliph. To that I have no answer, although I note that Cole also reports on details of some truly horrific behavior of al-Baghdadi prior to being thrown into Camp Bucca for 2005-2009, that he would bomb weddings and then bomb the funerals coming out of the bombed weddings. Such is our current world. Addendum: The tale of the history of caliphates is more complicated than is presented in any of my posts or in those of Juan Cole either, with quite a few self-proclaimed caliphs running around out there in different periods, most of them with little power, and also ongoing controversies about just who was a caliph or not and how much secular versus religious power they had. So, just to add a bit, there was another fairly serious rival caliphate to the Abbasids during 1130-1269 based in Morocco, which ruled portions of Spain for awhile as well. It may be that in the later stages of the Abbasid caliphate, there was a separation of religious from secular authority. And for the Ottoman sultans, whatever their claims earlier, it is clear that in 1880 Sultan Abdulhamid II made a major effort to assert that he was a full caliph, with this partly to make claims for ruling Muslims in India rather than the British (with some there actually recognizing his authority), as well as offsetting modernizing/Europeanizing "Young Turks," who would in the end overthrow both the sultanate and the caliphate in 1924 when Mustafa Ataturk was i power. And for those of you for whom it matters, Ramadan Karim, really (and apparently the now "IS" chose the first day of Ramadan to make their announcement, for better or worse). The new book that many conservative commentators are touting as representing a supposedly new and innovative set of conservative policy proposals is Room to Grow: Conservative Reforms fo a Limited Government and a Thriving Middle Class, put out by the YG Network and edited by Yuval Levin. Aside from a couple of general bloviatory chapters by Peter Wehner, Levin, and Ramesh Ponnuru, most of the rest of the essays do provide some proposals on various issues, with families the focus of three of the essays. Some of the proposals are not unreasonable, but only a few of them are really new, with many being old Republican standbys, in some cases going back as far as at least a half century. Robert Stein opposes cutting marginal income tax rates, but wants larger child allowances. Not necessarily unreasonable, but more like a marginal adjustment rather than a wild innovation. Frederick Hess wants school reforms, a hodge podge of online courses and education savings accounts and requiring schools to be more transparent about their "return on investment metrics." Aren't we already doing the latter with SOLs? Oh, and he wants to reduce regulations on teachers, which might not be a bad idea, but not again wildly innovative. Andrew Kelly wants to reform higher ed by changing the student-loan program for give incentives for higher ed programs to "remain affordable." I am all for restraining costs in higher ed, which have gotten way out of control, but attacking this through the student loan program strikes me as a no-go. The problem seems to be higher admin salaries and numbers, but how does messing with student loans do anything about that? Scott Winship advocates using block grants to states for anti-poverty programs. Now this is a proposal that is a good half century old, if not older, and an old perennial of conservatives. Michael Strain wants to increase employment by reducing licensing requirements, providing relocation assistance, and lowering the minimum wage for the long-term unemployed. The first looks good to me, but this is mostly controlled at state levels, although there has been a surge of this sort of rent seeking at state levels that should be stopped. I note that relocation assistance might cost money, ahem, although I think it is a good idea. No comment on the final one. Adam J. White wants to reform energy by encouraging fracking. The word "environment" appears once with policymakers urged to "take seriously the concerns that Americans voice regarding the new energy infrastructure's environmental impacts," although he clearly wants the infrastructure for fossil fuels to go through anyway. Not a whisper about climate change. Carrie Lukas is back with families, although opposing fed support of childcare, which she says parents do not like. She wants resources returned to parents that will be gained by "consolidating government spending programs," and she wants "policymakers...creating an environment so that women can pursue their vision for happiness and raise their children as they see fit, and target assistance on those truly in need." Does this mean that she opposes increasing the child exemption that Stein proposes? I do not know what specific policies lead to this outcome. James Pethokoukis wants financial reforms and an end to "cronyism," but is amazingly vague on how this is to be achieved, although he want "to limit regulation, reform the financial system, and allow for 'permissionless innovation,'" which this last I might support, but the rest looks like just total mush. Finally, W. Bradford Wilcox is back on the pro-family schtick, repeating Stein's call for increasing the child tax credit (to $4.000, how revolutionary!!! ), and he also wants to end the marriage penalty in various means-tested programs and the tax code, which I am also OK with, I think. Some of this is not unreasonable, while some is vague, and some is just worn out old stuff around forever (block grants to states again???). I will grant that this is better than the usual stuff one hears coming out of commentators on Fox News, so I suppose we should applaud all this reasonableness. So, what am I really picking on and where does the derpitude come in? Well, I had heard about this book previously, but one of my more scholarly libertarian FB friends posted a link to it through a piece in "The Week," by Pascal-Emmanuel Gobry, "Vox, derp, and the intellectual stagnation of the left," in which this book is touted as showing how conservatives are all innovative and new and underpy, while "the left," especially as shown by Ezra Klein's Vox and also the New Republic are suffering from "epistemic closure" and "derp." The comments for my friend's post were worse than even Gobry's with nobody realizing how, well, derpy they were all coming across as. Gobry claims that "the left" only supports three things, all of them supposedly showing "stagnation" (and derp) due to being "from the 60s." These are demanding higher marginal taxes on the rich, rasing the minimum wage, and tightening environmental regulation. Well, actually it was in the 60s that the top marginal income tax rates in the US began to be cut with the Kennedy-Johnson tax cut, but Gobry is too full of derp to apparently know that. Raising them is an old idea of the 30s and 40s. Minimum wages have been around since earlier as well, and it is true that in real terms they reached a max in the 60s, so anybody calling for increasing them would be heading vaguely back to then when we had lots of job growth in spite of those supposedly job killing high minimum wages (and while Strain wants to cut min wages, so innovative he is, although that has been going on since the 60s in real terms, so looks like another policy dating from the 60s, derp again). Finally, it was the 70s when major environmental legislation dates from, but Gobry (and the reform conservatives) do not seem to care at all that much of the world is worried about global warming. Not a problem for him or his people. Frack on, derp derp derp! Finally, as for Gobry's criticism of Klein's Vox, which I pay no attention to myself, his big criticism there is to dump on them having a bunch of posts defending Obamacare and saying that it works. How dare they? Somehow I do not think that Gobry has noticed Krugman's point that of 6 famous forecasts of doom about ACA by its opponents, not a one of them has come true. And in fact that this is what these articles in Vox are about. But, hey, Gobry is handing out a party line, even when it is screamingly false, while accusing those he is criticizing of engaging in derp. Sorry, but all the derp appears to be on the side of the one calling it out, which he thought he was being so clever to do. Instead, he is just engaging in derp, derp, derp all the way. "Say's Law sank without trace." The belief that the economy would find its equilibrium at full employment depended partly on what had long been called Say's Law — for J. B. Say, the French counterpart and interpreter of Adam Smith — and partly on the corrective movement of wages, prices and interest rates when there was unemployment. Say's Law, not a thing of startling complexity, held that, from the proceeds of every sale of goods, there was paid out to someone somewhere in wages, salaries, interest, rent or profit (or there was taken from the man who absorbed a loss) the wherewithal to buy that item. As with one item, so with all. This being so, there could not be a shortage of purchasing power in the economy. Movements in prices, wages and interest rates then validated J. B. Say and also ensured that the fundamental tendency of the economy would be to operation at full employment. People and firms saved from their income, and this saving had, obviously, to be spent. This happened when it was invested in housing, plant, capital equipment. If people saved more than was invested, the surplus of savings would bring down interest rates. Investment would thus be stimulated and saving (at least in theory) discouraged. So the excess of savings would be eliminated and Say sustained. Prices of goods would also fall in consequence of any short-fall in purchasing power that resulted from an excess of savings. This would encourage buying and, by reducing the income from which savings were made, also reduce savings. Again Say was sustained. Until Keynes, Say's Law had ruled in economics for more than a century. And the rule was no casual thing; to a remarkable degree acceptance of Say was the test by which reputable economists were distinguished from the crackpots. Until late in the '30s no candidate for a Ph.D. at a major American university who spoke seriously of a shortage of purchasing power as a cause of depression could be passed. He was a man who saw only the surface of things, was unworthy of the company of scholars. Say's Law stands as the most distinguished example of the stability of economic ideas, including when they are wrong. Supplementing Say, as noted, were the forces that kept the economy at full employment. These too were relatively straightforward. Were there unemployment, the competition for jobs would bring a fall in wage rates. Prices would be less immediately affected by the unemployment. The relationship of prices to costs would thus be made more attractive — real wages would fall — and workers whose employment was previously unprofitable to employers would now be hired. The fall in wages would not affect purchasing power; because of Say, that was always sufficient. Employment would continue to expand until the approach to full employment raised wage costs and arrested the hiring. Thus did the economy find its equilibrium at or very near full employment. From this also came the one decisive recommendation of the orthodox economists for ending unemployment. Do nothing to interfere with the reduction of wages in a depression. Resist all siren voices, including that of Herbert Hoover, who, it will be recalled, urged against wage cuts. On no matter was compassion so softheaded, for to keep up wages merely perpetuated the sorrow of unemployment and the sorrows of the unemployed. This was the doctrine, perhaps more accurately the theology, that Keynes brought to an end. There are numerous points of entry on his argument; perhaps the easiest is by way of the rate of interest. Interest, he held, was not the price people were paid to save. Rather it was what they got for keeping their assets in plant, machinery or similarly unliquid forms of investment — in his language, what was paid to overcome their liquidity preference. Accordingly, a fall in interest rates might not discourage savings, encourage investment, ensure that all savings would be used. It might cause investors to retreat into cash or its equivalent. So interest rates no longer came to the support of Say's Law to ensure that savings would be spent. And if Say's Law was no longer a reliable axiom of life, the notion of a shortage of purchasing power could no longer be excluded from calculation. It might, among other things, be the consequence of a reduction in wages. What people sought to save, in Keynes's view, had still to be brought to equal what they wanted to invest. But the adjustment mechanism, he argued, was not the rate of interest but the total output of the economy. If efforts to save exceeded the desire to invest, the resulting shortage of purchasing power or demand caused output to fall. And it kept falling until employment and income had been so reduced that savings were also reduced or made negative. In this fashion savings were brought into line with investment — which also, meanwhile, would have fallen but by not so much. The economic equilibrium so established, it will be evident, was now one in which there was not full employment but unemployment. Thus unemployment for Keynes was a natural condition of the economy. There was much else. And not all of Keynes's argument survived. The liquidity-preference theory of interest, for example, though it served Keynes's argument, did not gain permanent acceptance as a description of reality. But on two things Keynes was immediately influential. Say's Law sank without trace. There could, it was henceforth agreed, be oversaving. And there could, as its counterpart, be a shortage of effective demand for what was being produced. And the notion that the economy could find its equilibrium with unemployment — a thought admirably reinforced by the everyday evidence of the '30s — was also almost immediately influential. Before taking up today’s topic, let’s begin with the ground rules. Scientists like to be precise and comprehensive. They want to get the details right. For them, it’s important to know exactly how evidence was acquired and how reliable it is. It’s also important to use scientific terminology, since the words embody the conceptual structures that define and contextualize them. I’m not going to do science. My goal is much more limited, to summarize the main themes as they relate to the nature of the carbon problem and possible solutions to it. This wouldn’t be enough if we wanted to get concrete and quantitative—for instance, if we wanted to calculate potential impacts of various policies in parts per million (ppm) carbon concentrations or warming effects in fractions of a degree Celsius. As you’ll see, the objectives this time around are much more limited. With that behind us, let’s consider how carbon in the atmosphere, on land and water, and under the surface of the earth have interacted over the long haul. The earth is about 4.5 billion years old. (This would be a lot of birthdays if we knew what day it came into being.) Picture the scene 8/9 of the way to the present, about 500 million years ago. There was a lot of carbon in the atmosphere, about 25 times the level of 200 years ago, before humans started playing around with it. Through this process, carbon from the atmosphere makes its way into plant tissue and the tissue of organisms that feed on plants directly or indirectly, which is all of us. Of course, where there’s life there’s death, and dead tissue decomposes, releasing its carbon. The familiar smell of methane signals a gas (CH4) that returns organic carbon to the atmosphere. 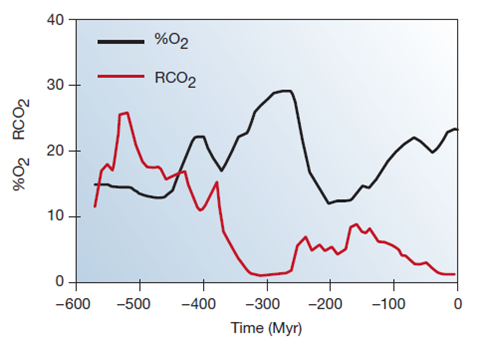 The red line is atmospheric carbon concentration as a multiple of its level 200 years ago. The black line is the percentage of oxygen in the atmosphere, which has varied inversely, more or less, with carbon. (Nitrogen makes up the rest.) In case you're wondering, planet Earth today is at 2x baseline carbon, another 1 is probably baked in, and 4 or more is guaranteed unless we change course. But I'm getting ahead. To be sure, it’s not a simple, predictable downward trend, since there are lots of other factors at work, which we will gloss over. The main point, however, is that, across the many ups and downs, the conversion of atmospheric carbon into living tissue and the sequestration of a portion of that tissue has had a systematic effect. It’s given us an earth today that is quite different from the one multicell organisms encountered half a billion years ago. So where did this carbon go? Some of it can be found in carbon-based minerals, but most was either buried in the earth’s crust or in sequestered methane. The pressurized underground stuff is what we call fossil fuels—coal, petroleum and natural gas. These deposits were formed over millions, even hundreds of millions, of years, and the carbon they embody is what was once in the atmosphere when the world was younger and a whole lot hotter. We’ll end this little review with our first takeaway: the problem of climate change stems from the exceptional cleverness of human beings, who have developed sophisticated methods to locate and extract fossil fuels. These are fantastic energy sources, dense and versatile. But in less than two centuries, humans have begun making noticeable progress toward undoing the last half-billion years of earth history. As you might expect, that could have consequences. Today’s New York Times carries an op-ed piece by Kevin Carey about the sorry state of America’s colleges and universities. Carey is the head of the Education Policy Program at the New American Foundation, which, in conjunction with the Gates Foundation and others, wants to restructure higher ed along the lines of market and market-like incentives. The evidence he offers is indirect: adults in the US who graduated from four-year institutions of higher education perform worse on a standardized exam, the Program for the International Assessment of Adult Competencies or PIAAC, than did similar adults in other countries. Of course, the US scores poorly at lower grade levels, as we know from the PISA comparisons. Presumably the students who enter college in the US come in with worse preparation than students elsewhere. The proper indirect test of higher ed quality, then, would be whether the US relative standing for students who attend college rises, falls or remains about the same between when they enter and after they leave. Indeed, if college grads in the US are less behind their peers in other countries post- compared to pre-college, that’s a gold star for American higher ed. You can’t tell if this is the case from Carey’s piece because his reporting on PISA doesn’t separate out college-bound students; he just gives averages for the entire population taking the test. If Carey ever decides to return to the shabby institutions of higher education he describes in his column, I’ll invite him to study economics with me. He can learn about an obscure concept called “value added”. This post begins a new series on policies to combat climate change, with an emphasis on clearing away the misconceptions that have grown up around the subject and now practically strangle it. While it would take a much bigger effort—a book really—to develop and document all the ideas to come, I’ll do what I can with a series of short, bite-size mini-essays. Given the format, they will sidestep most of the scholarly detail to make their case in the simplest, most direct possible way. I'd love to do a longer-form version of this series: maybe later. 1. Climate change is a pollution problem. 2. We need to set an emission target for 2030/2040/some other year to limit climate change. 3. Measures that reduce our dependence on fossil fuels mitigate climate change. 4. Reforestation can play a big role in combating climate change. 5. Personal change will solve the climate problem. 6. People who drive SUV’s are causing climate change; people who drive electric cars are the ones helping to solve the problem. 7. The goal is for every organization to become carbon neutral. 8. Local direct action against carbon-emitting projects will stop climate change. 9. Investing in clean technologies will solve the climate problem. 10. To set the proper climate policy we need to know the social cost of carbon. 11. Done right, climate policy can be nearly costless. 12. Economic growth is the underlying problem behind climate change. 13. Population growth is the underlying problem behind climate change. 14. Greedy oil companies are preventing action on climate change. 15. Carbon permits will just be a new source of financial speculation. 16. Carbon taxes are so much better than carbon permits as a basis for climate action. 17. Carbon taxes are a great way to raise money for green projects. 18. All we need to do is put a price carbon; the rest of the problems will take care of themselves. 19. Unless all countries agree to act on climate change, any national action is useless. At the end, it’s necessary to go beyond criticizing other views and stake out my own, what I modestly refer to as a non-misconceived agenda for combating climate change. Why am I doing this? Because no one else has. I'd love to be able to recommend a book that covers this terrain to friends, colleagues, students, and especially climate activists, but it doesn't exist. A series of blog posts is the easiest way for me to put these arguments in play, pending something weightier and more comprehensive. If you find problems with any of the arguments I make or the way I make them, let me know! I've been continually learning about these issues over the years, and I don't assume that I'm “all learned up” today. And if you think what I'm trying to do is worth doing, encourage me! It's easier to make an effort like this if you get the message that it's appreciated. Two concluding notes: First, the tone of most of these posts is pretty negative: they are about criticizing other people's thinking, after all. I'm not happy with this, especially since many of those who may feel under assault by what I'm writing are, for the most part, on the same side I'm on. Perhaps the tone is exacerbated by the agonistic culture of blogging. But to some extent it's the unavoidable result of adopting a format based on identifying and critiquing misconceptions. I've adopted this approach because it gets right to the point. Second, I'll admit to a certain amount of exaggeration in the way I've characterized these misconceptions. They're presented in an extreme form, without the nuance, qualification or context that usually accompany them. That's because I want to set them in relief and simplify the rebuttals. In real life, people usually hold more complicated views, but I hope that the logic behind the arguments I'm going to make will still be useful. UPDATE: This post has been significantly revised to reflect how the series has evolved. Supply Creates Its Own Demon II: You Don't, Say! "…adopted by Ricardo from the tedious Say (and to which we shall return when we discuss that miserable individual)…"
"…his authority, Say, is playing a trick on him here... "
"…we shall criticise Say’s theories later, when we deal with this humbug himself." "The constant recurrence of crises has in fact reduced the rigmarole of Say and others to a phraseology which is now only used in times of prosperity but is cast aside in times of crises." "This is the childish babble of a Say…"
"Say, who tries to hide his dull superficiality by repeating in absolute general phrases Smith’s inconsistencies and blunders…"
"After Garnier appeared the inane Jean-Baptiste Say’s Traité d’économie politique." "This is his kind of originality, his kind of productivity and way of making discoveries, And with his customary logic, he refutes himself again…"
"Say replies with his characteristic profundity…"
"…the absurdity of J. B. Say, who pretends to account…"
"…as it does to J. B. Say in the vulgarisation of Adam Smith." "The result he arrives at, is precisely that proposition of Ricardo that he aimed at disproving. After this mighty effort of thought, he triumphantly apostrophises Malthus…"
"A disciple of Ricardo, in reply to the insipid nonsense uttered by J. B. Say…"
Where division of labour is well developed, the skill of the labourer is available only in that particular branch in which it has been acquired; he himself is a sort of machine. It does not therefore help matters one jot, to repeat in parrot fashion, that things have a tendency to find their level. On looking around us we cannot but see, that they are unable to find their level for a long time; and that when they do find it, the level is always lower than at the commencement of the process. Thus, the anonymous author of An Inquiry into Those Principles Respecting the Nature of Demand, and the Necessity of Consumption, Lately Advocated by Mr. Malthus, neatly summed up in a paragraph the rebuttal to the so-called compensation theory. This succinct reply makes a mystery of Marx's exclusion of Say from his listing, at the start of the section, of bourgeois political economists. Already facing criticism for its plans to become an Irish company to avoid U.S. taxes, Medtronic, the Minnesota-based medical device maker, disclosed this week that it pays very little in taxes in the foreign countries where it claims to have profits. In Medtronic’s just-released annual financial report, the fine print reveals that the company’s total “permanently reinvested” foreign profits—that is, income they have said they have no intention of bringing back to the U.S.—rose from $18.1 to $20.5 billion in the past year. And the total amount of cash and cash equivalents that the company holds abroad rose abruptly from $10.9 to $13.9 billion in just one year. We’re willing to bet that just like Medtronic the other profit-shifting U.S. multinational companies know exactly how much it will cost to repatriate those earnings, but don’t want to let the public know of their tax-dodging ways. Actually, this should be no mystery for anyone who wants to go here and type in the company name (Medtronic in our case). In the financial footnotes under income taxes, one can see how much of Medtronic’s income was sourced abroad as well as how much they provided for foreign taxes. Foreign taxes relative to foreign income was about 10 percent, which is why Medtronic is able to report effective tax rates near 18 percent. Claims on proceeds from a lucrative patent auction dominated opening arguments Monday in the bankruptcy trial of former tech giant Nortel Networks. The proceeding follows mediation and other failed attempts to divvy up remaining assets of the Ontario-based telecom that have rang up more than $1 billion (U.S.) in professional fees so far ... Nortel, once North America’s largest telecom equipment maker, filed for protection from creditors in the U.S. and Europe after an acquisition spree built debt and in the wake of an accounting scandal and financial restatements. At its peak Nortel posted $30 billion in annual revenue, a stock market value of $250 billion (U.S.) and had more than 90,000 employees. But the fallen tech giant left tens of thousands of pensioners fighting for a share of its assets, with retirees pitted against hedge funds, governments, former suppliers and other creditors in Europe, the U.S., Africa and the Middle East. Before dealing with claims from pensioners and other creditors, however, the courts must decide on how to divide assets among debtors, referring to the company’s former head office in Canada and its subsidiaries around the world. Canadian creditors argued in depositions filed with the courts that the Canadian Nortel operation legally owned the patents and is therefore entitled to the bulk of the sale proceeds. U.S. bondholders say U.S. businesses held licenses for the patents and are thus entitled to a fair share, while lawyers for Nortel’s European units argued in court that the patents covering technologies for mobile phones and tablet PCs were largely developed in Europe and sale revenue should accrue where it was produced. For once I am not going to be too critical of a column in the Washington Post, this one two days ago by the sometimes execrable Richard Cohen on The Lessons of World War I. Indeed, I applaud his noticing that we are coming up on the centennial this Saturday of the assassination of Austrian Archduke Ferdinand by Gavrilo Princip in Sarajevo that touched off World War I and all the horrors that came out of it, including WW II. I completely agree with him that this is as good an example in history of a butterfly that flapped its wings and caused a hurricane, as in the old Edward Lorenz story from climatic chaos theory that a butterfly flapping its wings in Brazil could cause a hurricane in Texas. As an old chaotician, I like these sorts of analogies and simply remind everybody that this most famous of ideas associated with chaos theory is formally known as "sensitive dependence on initial conditions." Of course, I do have some criticism, albeit mild this time around, more a matter of taste. Cohen spends part of the column comparing that awful event to the current situation in the Middle East, particularly in light of the ISIS successes in Syria and especially Iraq, with it very unclear how far this will go, although I seriously doubt it will result in anything as ultimately destructive and awful as World War I. My fuss is with what he suggests is the equivalent "butterfly flapping its wings." His candidate is the "uprising in Syria." I beg to disagree and figure that this is just more neocon whining that Obama did not support the moderate opposition in 2012, although there is near zero reason to believe that his doing so would have led to either the overthrow of Assad or preventing the rise of ISIS in Syria. As it is, I do think that there is a much more obvious butterfly flapper than that on two grounds, both on being much smaller and more buttefrly-like and also in terms of being more fundamental in terms of causation. That butterfly flapper would be the self-immolation of the small vendor in Tunisia somewhat earlier (sorry, do not have his name). This was really a small event, arguably smaller even than the assassination of Ferdinand. But it set off the Arab Spring, and I think it is pretty straightforward that the uprising in Syria started out inspired by the Arab Spring, whatever one thinks of either the Arab Spring or the uprising in Syria. As it is, the uprising in Syria is already a pretty big deal, not just some butterfly flapping its wings, it is already at least a substantial windstorm, if not a full-blown hurricane. I remind that at least in Tunisia, where it started, the Arab Spring has turned out not so badly, with the corrupt dictatorship of Ben Ali overthrown, and after a period of rule by a moderate Islamist government now a largely secular democracy in place, just the sort of thing people in the US like. I would also note that Tunisia is just about the only nation in the Arab world where this has been the outcome. Forget about social responsibility. It's a matter of simple risk diversification principles. Norway's sovereign wealth fund should not invest at all in assets tied to fossil fuels. If anything, it should lean toward assets that move in the opposite direction from fossil fuel prices. This fund, of course, is entirely financed by Norway's North Sea oil royalties. Its future revenues from this source, then, are dependent on oil prices. These fluctuate with short run events like the pace of global economic growth (demand) and civil unrest in petrostates (supply). The biggest long term factor, however, is whether there will be significant movement toward climate change mitigation. At present next to nothing is being done. The problem is immense, however, and there is an obvious risk, from the point of view of an oil producer like Norway, that new evidence of climate sensitivity will frighten governments into action before deposits are exhausted. If there is a major intensification of policy, it will result in massive earnings reductions for oil and coal, and possibly also natural gas—of which Norway is also a significant exporter. (Prices will shoot up, but this effect will be captured either by governments or by resource-using businesses if permits are given away.) To put it differently, the point of mitigation measures is to leave fossil fuels in the ground, which would mean that resource owners like Norway would simply have to write off these assets. Given that risk, the prudent thing to do is to avoid any investments whose returns are positively correlated with it. That means divesting from Shell and any other fossil fuel companies. A rational hedging strategy, on the other hand, would call for investments in companies whose prospects are tied to aggressive carbon policy, such as those in the renewables sector, public transportation, and whose products compete with fossil fuel-intensive goods. Sometimes social responsibility points in one direction and sound finance in another; here they converge. It’s remarkable there should be any debate at all. You may be tempted by the novelty. I am not a specialist in the economics of education, and I don’t have the evidence to back up what I’m about to say—but I’m pretty sure I'm right. The ongoing debate about student debt is simply insane. Of course, we can argue for decades over how much and what forms of public subsidies students should get for the immense financial expense of higher education, and in a narrow sense the nuances matter. But surely the big picture is missing here, isn't it? Once upon a time, when I was young, there was a two-tiered system in the US, with expensive private colleges and universities for those who could afford them and nearly-free public education for everyone else. Then decisions were made. The US has a mostly decentralized structure in which the provision and financing of public higher education occurs at the state level, but somehow, miraculously, every state in the union simultaneously began a process of shifting costs from taxpayers to students and their families. 1. Evidence accumulated that college graduates were earning a lot more than high school grads. It seemed unfair to make everyone pay for something that primarily benefited just a few. This was especially the case since college attendance is strongly correlated with class. To shift the cost of public higher ed to tuition seemed to be in line with “fairness”. 2. Private schools chafed at the subsidized competition. They have a lot of pull, since their graduates are everywhere, and they lobbied for higher public tuitions. This could be justified through arguments about the virtues of competition, a level playing-field, etc. 3. Greater labor mobility undermined the economic growth case for public subsidy. Any individual state could choose to make higher ed more expensive and then import qualified workers from other states. (My own state of Washington has the second lowest per-student expenditure for higher ed in the country but also a thriving high-tech sector, which draws in workers from everywhere else.) At the national level the US has been able to attract as many foreign-trained engineers, doctors and other specialists as it needs. 4. Connected to item 1, elite thinking began to frame education at all levels as a consumer good, and schools as businesses with customers. Once you begin to think this way, there are lots of reasons why consumers should be charged the marginal cost. Of course, by withdrawing public support for higher education, tuition skyrocketed—a feature, not a bug. This in turn called for new public policies to facilitate lending to students so they could pay these costs, since, as you learn in introductory economics, a problem with human capital is that it can’t be collateralized. And the upshot of all this is an explosion of student debt, which brings us back to our starting point. Meanwhile, higher education itself has been devastated by these developments. The US, which was once a world-leader in the proportion of its students who completed a BA, is now behind the global peloton. Students take on part-time jobs, not to mention multiple and full-time jobs, to finance their education even as they try to keep up with their studies. I often see heads bobbing, fighting off sleep, from students I know are putting in 20 or more hours per week at work. This in turn has led to a reduction in the amount of outside assignments, such as reading and papers, faculty can require without feeling like sadists. And now there is a powerful trend to restore the two-tiered system, but by cheapening the public product rather than elevating the private one. This is where “disruptive” online instruction is headed—depersonalized, rigid, “competency”-based learning for the many and the traditional classroom model, which can be rich, intensive and transformative, for the affluent few. Note however that this is not a universal trend. It is furthest advanced in the US, with England and Australia beginning to catch up. Canada has not gone this route, and it has barely begun to have an impact in continental Europe. (Germany tried to introduce a modest tuition at its public universities and students rebelled; the government backed down.) The conversion of higher education to a consumer good is not inevitable. So here’s what I'd like to know: who exactly made the decisions to eradicate free public higher education in the US? Why was there no debate? Why here and not everywhere else? Why is this question still off the table in the US even as “access” remains a key political issue? And what would it take for this country to make a second decision to reverse the first one? Is The Neo-Zengist DAEESH State Really A Wannabe Caliphate? OK, since I have no answers about what to do about the situation in Iraq, I am going to once again engage in my usual obfuscating putdown of nearly all commentators who exhibit ignorance about the situation over there. About all I can say is that it looks like maybe the Obama people are not quite as ignorant as the Bush people were, and maybe a bit more cautious. Anyway, again I have to thank the intrepid Juan Cole for producing a map from the early 1100s that shows a configuration of states that somewhat resembles what exists now on the ground de facto in the area of Syria and Iraq. There was no unified Iranian state, but much of what is now eastern Turkey was ruled already by the Seljuq Turks (western part by the Byzantines), Syria minus its northern part was ruled by the Atabeg dynasty; approximately what is now Israel was the Crusader Kingdom of Jerusalem; southern Iraq plus Kuwait and some more was the Abbasid Caliphate, and the area approximating what is now controlled by DAEESH (or ISIS or ISIL, if you prefer, a bit more on that in a minute) was a non-very-long-lasting state ruled by Imad al-din Zengi, hence the name "neo-Zengist," including what is now northern Syria and most of what is now northwestern Iraq. The only thing that would come of out of this state of any importance was Saladdin, who retook Jerusalem from the Crusaders, and the province in modern Iraq now ruled by DAEESH, Salahuddin, was named for him using his Arabic name (he was actually Kurdish). So, more obscuranta. DAEESH is the most widely used transliteration of the Arabic name for the group, usually called either ISIS or ISIL. The latter is really silly, as the "L" stands for "Levant," a completely anachronistic and Orientalist name for what was known in Turkey as "Greater Syria," which included Syria plus Lebanon, Israel, Palestine, and Jordan, more or less. In Arabic the name for this, which gives the "SH" at the end of "DAEESH," is "al-Sham," which is indeed a much older name for the area, dating back at least to the Ummayyad Caliphate, 661-750, which had its capital in Damascus, the current capital of what is left of Syria. So, "ISIS" is better than "ISIL," as it can stand for "Islamic State of Iraq and al-Sham." So, I do want to disabuse two more distorted ideas floating around, namely that this state ist a nascent "Caliphate," something that is being widely repeated, including in two front page stories today in the Washington Post, and that it was thrown out of al Qaeda for being more violent than al Qaeda's leadership approves of. The latter is easily dismissed. Zawahiri disowned DAEESH because he backs another Islamist opposition group in Syria, Nushrat, and is angry that DAEESH has defeated them and is now the main group and is not following his orders. It had nothing to do with them being more violent than the group he backs or any other group he backs, pretty much all of which are violent. It is simply a matter of turf and control, and the leader of DAEESH, the somewhat mysterious Abu Bakr al-Baghdadi, does not take orders from him. BTW, just for the record, DAEESH is clearly very violent and also very fundamentalist, although I have not heard that they forbid women from driving as is done in our ally, Saudi Arabia. But let us deal with this matter of whether or not this neo-Zengist state is a "wannabe Caliphate." Now, I cannot prove that it is not. But the evidence that it is turns out to be mostly coming from flamingly neocon sources. If one pushes into Arab sources, there is no evidence of this, and the most one can do is make inferences from scattered pieces of evidence. Officially, al-Baghdadi has been "Amir al-Hakim," Ruling Emir, the same title that Mullah Omar had in the Taliban regime, which may be more of a model. A Ruling Emir does have authority over religious matters, but is far from being a Caliph, or Khalifa (with a Caliphate being a Khilafa). Now, al-Baghdadi has just turned this over to another person, so maybe he is about to declare himself Khalifa, but he most definitely has not done so up until now, so most of the discussion of this in the western media is wildly wrong. The strongest argument that he might do so is that this name he took, which is a nom de guerre, includes "Abu Bakr," who was the first Caliph. So, maybe, but not yet. What does it mean to be Khalifa? The term means a lot of things, including Successor, Servant, Viceroy, and some others. Traditionally a Caliph is supposed to be the Successor to the Prophet Muhammed as the spiritual and political leader of the Ummah, the world Islamic community (the word "Umm" means "mother"). Following the Prophet's death, he was succeeded by four such Caliphs, his uncle Abu Bakr, Umar, Uthmann, and Ali, his son-in-law, these known as the "Rashidun" or "righteous" Caliphs. After Ali's death came the Sunni-Shi'i split with the Shi'is supporting Hasan, Ali's son by Fatima, the daughter of the Prophet, but Muawiyah of the family of Uthmann defeated and killed him and became the next Caliph, establisling the Ummayyad Caliphate that would rule from Damascus until 750. During this period it expanded control from Spain to Central Asia. It would be succeeded by the Abbasid Caliphate, that ruled mostly from Baghdad from 751 until being overthrown by the Mongols in 1258. There was a rival Fatimid Shi'i Caliph in Cairo from about 900-1100, one of whom burned the Church of the Holy Sepulchre in Jerusalem, providing the official cause d'etre of the Crusades. There was a "Shadow Caliphate" run by Abbasids in Cairo after the fall of Baghdad, but then the Caliphate was taken over by the Sultans of the Ottoman Empire after the fall of Constantinople in 1453, who would hold it until it was abolished in 1924 by Ataturk. There was a brief effort to claim it then by Sharif Hussein a-Hashim, the traditional ruler of Mecca and a descendant of of the Prophet, but in 1925, King Abdul-aziz (aka "Ibn Sa'ud") roared out of the desert from Riyadh and threw him out for being a total sinner. He did not take the title, which has remained unclaimed except by occasional oddballs, although the Saudi kings are most proud of being "Protectors of the Holy Cities," meaning Mecca and Medina. The British would reward the Hashemite Sharif for his loss by making his sons kings of Jordan (Abdullah I) and of Iraq (Faisal I) respectively, with that family still ruling Jordan under Abdullah II. I note that the word shows up in other places. So there are regional officials in Morocco who carry the title of "Khalifa," but there it means "viceroy" or "governor." The Shi'a have mostly substituted "Imam" for it, but the 7-Imam Shi'i, the Zaydi, of northern Yemen, called their leaders by the title until 1962. And the royal family of Bahrain, Sunnis ruling over a Shi'i majority, happen to be named "al-Khalifa." Anyway, certainly DAEESH or ISIS or whatever is a nasty violent bunch pushing a hardline version of the Shari'a and would like to conquer at least Iraq, or at least Baghdad. But there is little evidence that they are a "wannabe Caliph" from serious sources, with this mostly a neocon myth perpetrated successfully in the gullible and ignorant western media, although it cannot be ruled out that Abu-Bakr al-Baghdadi might just declare himself this title. But he has not done so yet, contrary to widespread impressions. In 1818, the year Mary Shelley's Victor Frankenstein was in the lab throwing switches and checking gauges amid the lightning flashes, similar actual experiments were underway in a Scottish university. Professor Andrew Ure connected a tube to a battery and shoved it up a corpse's nose. "The tongue moved out to his lips," it was reported. "His eyes opened widely. His head, arms and legs moved." Apparently the body stood up unaided, laborious breathing commenced, and the assembled students screamed out in horror, as well they might. Professor Ure had to stab the creature in the jugular vein to calm it down. Supply Creates Its Own Demon: Marc Andreessen and "Textbook Luddism"
A growing number of people seem to fear that robots will eat all the jobs. Their worry boils down to this: computers can increasingly replace human labour thus displacing jobs and creating unemployment. Your job, and every job, will go to a machine. It is textbook Luddism, relying on a “lump of labour” fallacy – the idea that there is a fixed amount of work to be done in the world by humans. The counterargument comes from economists such as Milton Friedman, who believe that human wants and needs are infinite, which means there is always more to do. Mr. Andreessen knows as much about Luddites and the lump-of-labour fallacy as I do about programming browsers. Ordinarily, it might suffice to cite the ONLY published scholarly articles on the history of the phony fallacy: "Why economists dislike a lump of labor" and "The'lump of labor'case against work-sharing: Populist fallacy or marginalist throwback?" both by a fellow named Tom Walker. But Andreessen's timing has caught me in the midst of a research/writing project that attempts to make sense of what Joan Robinson identified as "mumpsimus": the persistence of discredited arguments in the face of overwhelming evidence. I'm about 20 pages along in my new piece, Supply Creates Its Own Demon. The demon in the title refers to Maxwell's demon and, by association, the chess-playing automaton (an elaborate hoax) built in the late 18th century by Baron Ludwig von Kempelen. I've just gotten to the section where I discuss Andrew Ure's 1835 The Philosophy of Manufactures. Ure's book contains a discussion of automatons, which includes the chess-player but doesn't mention its imposture. The third section of Philosophy of Manufactures, "Moral Economy of the Factory System," relies heavily on Edward Carleton Tufnell's supplementary report for the Royal Commission on the Employment of Children in Factories, which is one of the most sustained anti-union diatribes in English literature. Tufnell went on to write Character, Object and Effects of Trades' Unions. I have credited Tufnell's diatribe with "putting legs" on the bogus fallacy claim -- I could amend that to say Ure's appropriation of Tufnell's claim put wheels on it. An article by Steve Edwards, "Factory and Fantasy in Andrew Ure," makes a convincing case for the influence of Ure's Utopian analysis of the factory on Marx's analysis of "real subsumption of labor" in the originally unpublished "chapter six" of Capital, "The Results of the Immediate Process of Production." Marx's analysis is, in a sense, an "immanent critique" in that it uses insights from Ure's text to highlight incongruities and contradictions in his argument. Briefly, Ure argued both that workers delayed technological progress that would have benefited them through collective action and that collective action by workers accelerates technological advance, to the detriment of the workers. Or more simply: strikes delay and accelerate technological progress that helps and hurts workers. This is a "nice knock-down argument" to be sure but it couldn't be more arbitrary. Coming back to Marc Andreessen's column, his argument is a pale shadow of Ure's. For all its overt hostility to workers and unions, I prefer the original Philosophy of Manufactures because in its fantastic exposition it laid bare the essential incoherence of its premises. No one in the econ blogosphere has gone after Greg Mankiw, who did his best to provoke outrage with his latest New York Times column. “Debunking” Piketty, Mankiw says that rich people save because they are altruistic toward their unfortunate kids, who, because of regression to the mean, won’t be as financially successful as they are. But the unintended consequence of all this saving is that the capital-labor ratio changes, and the principle of diminishing marginal productivity means that the rate of profit will fall and wages will rise. Hence Piketty’s patrimonial capitalism is good for the workers! Because capital is subject to diminishing returns, an increase in its supply causes each unit of capital to earn less. And because increased capital raises labor productivity, workers enjoy higher wages. In other words, by saving rather than spending, those who leave an estate to their heirs induce an unintended redistribution of income from other owners of capital toward workers. The bottom line is that inherited wealth is not an economic threat. Those who have earned extraordinary incomes naturally want to share their good fortune with their descendants. Those of us not lucky enough to be born into one of these families benefit as well, as their accumulation of capital raises our productivity, wages and living standards. 1. All resources are fully employed, and the economy is on its production possibility frontier. 2. A decision to save, by lowering the cost of capital, increases the quantity of investment. 3. Financial and real capital are identical, and the return to the first is the return to the second. 4. All savings and investment occur in the same economy; rich people do not earn income from investments elsewhere. 5. All prices represent true social costs and benefits. There are no profits to be made except by increasing the net wealth of the community. For instance, transfers and uncompensated externalities play no role whatsoever in profits. 6. There are no monopoly profits, with the exception of self-extinguishing temporary monopolies associated with wealth-creating innovations. 7. But, in partial contradiction to (6), there is no technological change at all, since it would alter the marginal productivities of labor and capital. 8. Production sets are convex everywhere; there are no increasing returns or interactions between resources or activities that would give rise to nonconvexities and multiple equilibria. On top of all this, it should be pointed out that, if Mankiw is right, the rate of profit—Piketty's r—should fall as the capital-income ratio rises. But a central argument in Piketty's book is that r is remarkably consistent through relative capital accumulations and decumulations, a steady 4-5%. There isn't a single dollop of data in Mankiw's little piece that challenges Piketty's finding. Putting all of this together, it doesn't sound like the sweeping conclusion at the end of Mankiw's column is justified, does it? But Greg’s a smart guy! He doesn't really think that his op-ed is summing up the state of scientific knowledge. He knows everything I've written above. Some of it is even in his textbook. Clearly his goal is not to make a defensible economic argument. To take him seriously is to miss the point. When he wrote this column Greg had a twinkle in his eye. He’s thinking to himself, “This is really going to annoy the liberals!” That’s what the central message of microeconomics is about, after all, once you put aside all the caveats and unlikely assumptions: self-interest is good for everyone, a free market is the optimal form of economic organization, and there is no conflict of interest between the rich and the rest. In real economics these propositions are hypotheses to be examined and quite often rejected, but in ideological economics they are ammunition to attack the left. When Mankiw teaches Econ 10 at Harvard, he has many kinds of students scattered through the auditorium. Some are bored. Some are intrigued but have lots of questions that intro econ can’t answer. Some walk out. But you can be sure there are a few whose eye’s light up when they hear about the virtues of free markets and self interest. They're the ones who are thinking, “Wow, that must really annoy the liberals!” A significant chunk of them will decide to become econ majors and then go on to get PhD’s and teach their own Econ 10's. Of course, most economists aren't like this. I think a majority are fairly centrist in their politics and moderately skeptical of ideologies that rest on a raft of assumptions and a paucity of data. But every econ department at a college or university seems to have at least one of the Mankiw spawn, whose greatest pleasure is piss off the do-gooders. When they populate recruitment committees and journal editorial boards the twinkle becomes a scowl, and ideological rigidity becomes a filter for the rest of the profession. It’s not all in fun. I was going to let Paul Krugman’s aside about the trade deficit being “determined” by net national savings pass, but Dean Baker has unintentionally prodded me into action. Imagine if you will an economy in which people are earning income, borrowing, saving, generating income for one another by buying domestically produced goods and selling exports, and withdrawing income by buying imports. To contribute to a trade deficit is identically to increase expenditures relative to incomes. Neither determines the other. It is, of course, a reasonable question to ask what causes domestic budgets and the current account to have the configuration they have. It’s a bit like asking, did your team play great or did mine play lousy? We don’t have a language for this sort of distinction in economics. In the article I wrote on this topic I used the phraseology “active” and “passive” and argued that trade decisions are more likely to be active. Actually, I’m not sure about this, either the active-passive frame or the bias toward “trade did it”. Let me give a real world example, Germany. Germany has a persistent current account (trade) surplus. In fact, its economy is brilliantly organized to generate surpluses. But it is also a country in which saving is practically a sacrament. Germany is currently freaked out that the ECB will charge interest on reserves, which puts even more downward pressure on non-policy interest rates. How horrible to punish virtuous savers like this! So there you have it: a big external surplus and lots of domestic savings. Does either “determine” the other? No, they are identically the same thing. If Germans ran out and spent their money on imports, they wouldn't save and they wouldn't have a trade surplus. (If they spent their money on domestic goods only, with no ripple effects on imports, they’d have exactly that much more money so the impact on savings would cancel out.) If they decided this summer to forego their beloved Frisian and Baltic islands and all go for vacations in the Mediterranean, their external surplus would fall, they would generate less domestic income, and their savings would be down equivalently. The accounting identities simply reflect the fact that, when you add up the two sides of the ledger, you have two measures of the same thing. To move the discussion back to the US, our situation can be described in terms of our awful trade performance (which Krugman acknowledges) and the willingness of borrowers to borrow and lenders to lend to finance consumption as income fails to keep up with expenditure (as it will if there is current account leakage). All of this is part of the same, single, identical story. You all played better and we all played worse. UPDATE: Why does it matter? Is this whole business just pedantry, taking a small point, the difference between an equality and an identity, and making a big deal out of it? No. The argument that net national savings “determines” the trade balance has enormous practical consequences. It means that trade policy can simply ignore issues of trade surpluses and deficits. Trade agreements, offshoring, global regulatory arbitrage, industrial policy—all of this, by theoretical edict, is allowed to affect only the composition of trade, not its balance. Meanwhile, for a country like the United States, with a chronic and obviously debilitating current account deficit, the remedy is said to be save, save, save. So fiscal austerity, cuts in Social Security, defined contribution pension plans and anything else that seems to contribute to net savings rises to the top of the policy agenda. To his credit, Krugman himself has not been a part of the savings mob, at least not since 2008. But why give credence to the erroneous reasoning that fuels it? UPDATE II: And another thing: the claim that the trade balance is “determined” by net saving, which in turn is the result of other stuff that have nothing to do with trade, is the basis for the assumption of fixed balances that underlies the entire microeconomic edifice of trade theory. All those lovely theorems simply assume that a given change in trade policy, or technology or whatever leads to perfectly offsetting changes in the value of imports and exports. Drop the assumption—allow the trade balance to change when policy or some other factor changes—and you’re in a different world, one where the comforting strictures of comparative advantage theory no longer apply. Mainstream trade theory has two separate steps. First net savings determines the trade balance, then the various micro and policy forces determine trade composition. If you recognize the identity between net savings and the current account, however, any two-step process is a fundamental conceptual error. One thing, one step. The Ideological Fraud of Adam Smith, beginning with the pin factory. I just posted the paper I will give tomorrow at the History of Economics meetings. The Ideological Fraud of Adam Smith, beginning with the pin factory. I hope you enjoy reading what a fraud he was. Smith’s train of thought is confusing. First, the law is needed to constrain the fury of the poor; then the market provides for the poor very well; followed by the wretched state of the people who worked on the land the least fortunate of the workers. For his grand finale, after decrying the “small share” of the poor, Smith curiously veers off to ask what accounts for “the great share” that these same people have. His answer should come as no surprise to a modern reader of Adam Smith “The division of labour amongst different hands can alone account for this” (Smith 1762 1766, p. 341). Today, few people would recognize Smith’s pin making operation as a factory. It was simply a small workshop that would not have been much out of place in Smith’s imaginary village. Smith himself referred to the pin factory as a “frivolous example” and later as “a very trifling manufacture.” (Smith 1762 1766, vi.34, p. 343; Smith 1789, I.i.3, pp. 14 15). But now, with the magic of the division of labor, Smith could portray society as a harmonious system of voluntary, commercial transactions. Because the economy could produce more, workers could consume more, and perhaps one day even have their own trifling enterprise. The mere rearrangement of work created a great leap of productivity. Smith told his students that a worker might have been able to produce something between one and twenty pins per day, but with the division of labor, the output per capita soared to two thousand. By the time he published The Wealth of Nations, the number more than doubled to 4,800 pins (Peaucelle 2006, p. 494; Smith 1789, I.i.3, pp. 14 15). Granted that the division of labor can improve productivity, how was such dramatic productivity possible? It wasn’t. An early draft of The Wealth of Nations explains the secret of this jump in productivity. There, Smith began his description of pin production with “if the same person was to dig the metal out of the mine, separate it from the ore, forge it, split it into small rods, then spin these rods into wire … ” (Smith 1759, p. 564). Aha! In his later estimates, the workers’ tasks began with wire already in their hands. No wonder they could produce so much more. Much of their work had already been completed before they began. Even if the division of labor was responsible for a significant part of this increased productivity, further dramatic advances were unlikely to come from rearranging workers’ tasks. And other than his earlier statement that “The division of labour amongst different hands can alone account for this,” Smith never directly made the assertion that the division of labor alone was responsible for all technical progress. However, the absence of any other explanation (as well as his silence regarding modern technology) gives the impression he still held that belief. The economic historian, John H. Clapham, once lamented, “It is a pity that Adam Smith did not go a few miles from Kirkcaldy to the Carron works, to see them turning and boring their cannonades, instead of to his silly pin factory which was only a factory in the old sense of the word” (Clapham 1913, p. 401). Smith never took notice of the Carron Works in his great book, even though Kirkaldy was within easy walking distance from the great factory. True, he would have needed a short ferry ride to cross a river for his walk, but this factory was one of the most famous, and perhaps the largest, industrial plant in the world, remembered today mostly for its cannons that helped the British navy create and maintain a great empire. The Company maintained a major warehouse in Kirkcaldy proper to hold the iron rods and receive the nails in return from the busy local nail makers. However, the closest Smith came to mentioning the Carron works occurred in a brief reference to a recent increase in employment in Scotland, where Carron was one of the three towns mentioned (Smith 1789, I.viii, p. 94). Smith’s contemporaries understood that the world was rapidly changing. Yet scholars who have studied Adam Smith have expressed puzzlement that the prophet of modern capitalism had so little to say about the technological developments taking hold around him. Early in the book, Smith did mention in passing “the invention of a great number of machines which facilitate and abridge labour, and enable one man to do the work of many” (Smith 1789, I.i.5, p. 17), but he avoided any further discussion of the modern industry that was emerging around him. Smith was not unworldly at all. He was engaged in the construction of a sophisticated ideological structure. Nothing is more revealing about this project than his famous pin factory. Thomas Hobbes, Call Your Office! Learning about Learning about "New Keynesianism"
Working less: "Is there a history of this idea?"